How does a hospital become or fail to become hospitable for patients? What does neurological rehabilitation entail in a postcolonial hospital? This chapter investigates how patients and health workers in the rehabilitation of a French-Caribbean hospital form and cultivate therapeutic relationships, and navigate the constraints of the therapeutic landscape in which they live: the crumbling infrastructure of a public hospital facing financial pressures, as well as the history of colonialism and slavery that continue to weight on the present. In particular, it follows the hospitalization course of a woman who invoked a world of chariots, kings, and princes to negotiate effective relationships with her therapists. The creative relational strategies she implemented to transform the clinic into her “kingdom” reveal the chronic conditions and the racial dynamics she had do navigate in order to build therapeutic alliances with her health workers. 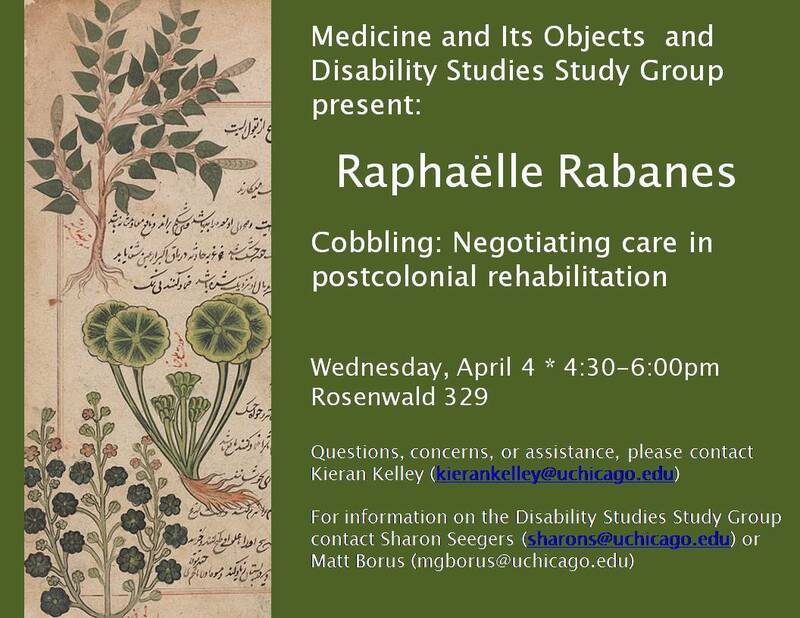 Raphaëlle Rabanes is a PhD Candidate in the joint Medical Anthropology Program at UC Berkeley and UC San Francisco. Before turning to anthropology, she trained and practiced as a Clinical Psychologist in France. Today, she teaches and writes at the intersection of Medical and Psychological Anthropology, Disability Studies, African Diaspora Studies, and Critical Race Theory. Her research focuses on community responses to health and racial inequalities in the long aftermath of colonialism and slavery. Her dissertation, Postcolonial Repair: Memory, Embodiment, and Therapeutics in the French Caribbean, explores what it entails to move, speak, and remember as Afro-descendant citizens of Guadeloupe, a French overseas department and one of the few non-sovereign territories in the Caribbean. To receive the paper, or if you have any questions or require assistance to attend, email the MaIOW coordinator: Kieran Kelley (kierankelley@uchicago.edu). Also, please contact the coordinator if you require an alternative format of the paper.